To the east of the road here, centering at Fort Magruder, was fought the Battle of Williamsburg on May 5, 1862. The Union General McClellan was pursuing General Johnston’s retiring army, the rearguard of which was commanded by General Longstreet. Johnston ordered Longstreet to hold off McClellan’s attacking forces until the Confederate wagon trains, bogged down in mud, were out of danger. This mission was accomplished and Johnston continued his retirement. Location. 37° 15.878′ N, 76° 40.76′ W. Marker is in Williamsburg, Virginia, in James City County. Marker is at the intersection of Pocahontas Trail (U.S. 60) and 5th Avenue, on the left when traveling east on Pocahontas Trail. Touch for map. Marker moved from this location to a place directly in front of the MaGruder Hotel and Conference Center. Marker is in this post office area: Williamsburg VA 23185, United States of America. Touch for directions. This site saw some of the most intense fighting of the May 5, 1862 battle between Johnston's rearguard and McClellan's pursuing army. After the battle, which resulted in a stalemate, this area became known as the "Bloody Ravine." Peninsula Campaign (within shouting distance of this marker); Quarterpath Road (about 300 feet away, measured in a direct line); History of Fort Magruder (about 500 feet away); Magruder’s Defenses (approx. 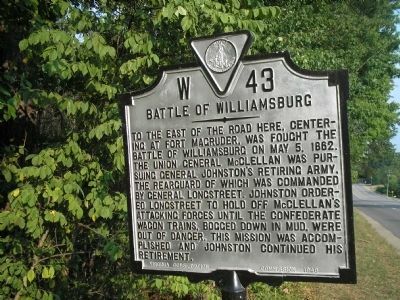 0.4 miles away); a different marker also named Battle of Williamsburg (approx. half a mile away); a different marker also named Quarterpath Road (approx. half a mile away); Vineyard Tract (approx. 0.7 miles away). Touch for a list and map of all markers in Williamsburg. More about this marker. Marker inscription has been updated with new marker, with same W 43 marker number. Regarding Battle of Williamsburg. The Battle of Williamsburg, fought on 5 May 1862, was the first major engagement of the Peninsula Campaign. Union Maj. Gen. George B. McClellan, slowly advancing from Hampton Roads toward Richmond, encountered the rear guard of Confederate Gen. Joseph E. Johnston’s westward-moving army near here. Confederates under Maj. Gen. James Longstreet delayed the Union advance in a fierce, daylong battle in a driving rain. Nearly 41,000 Federals and 32,000 Confederates were engaged, with about 4,000 casualties. The result was a draw, although both sides claimed victory. The next day, the Confederates continued marching toward Richmond and Union troops occupied Williamsburg. My 4th great grandfather, George Michael Biedermann, Co. F of the 98th Pennsylvania Volunteers was killed on May 5th at the Battle Of Williamsburg. He was either a Corporal or Sergeant at the time of his death. His wife's Widow's Pension file refers to both ranks on different documents within the file. He was a German immigrant living in Philadelphia Philadelphia with a wife and 5 children. — Submitted May 30, 2011, by Dennis Cox of Cherry Hill, New Jersey. Credits. This page was last revised on March 1, 2019. This page originally submitted on August 10, 2008, by Bill Coughlin of North Arlington, New Jersey. This page has been viewed 1,726 times since then and 29 times this year. Last updated on February 27, 2019, by Brandon D Cross of Flagler Beach, Florida. Photos: 1, 2. submitted on August 10, 2008, by Bill Coughlin of North Arlington, New Jersey. • Bill Pfingsten was the editor who published this page.